A 45-minute train ride from Antibes got us into Monaco in time to climb up the hill to the Palais du Prince (Prince’s Palace) to watch the changing of the guard, which takes place every day at 11:55am sharp, among a throng of curious onlookers. Afterwards, we got into the fast-moving line to get tickets to tour the Palace, where no photographs were allowed to be taken. After lunch in Monaco-Ville (the Old Town), we walked across town along La Condamine (the Port of Monaco) to the Monte-Carlo Casino, which is in what is considered Monaco’s New Town. The Casino was built in 1878 by the well-known architect who built the Paris Opera House, Charles Garnier. The Casino is the major source of revenue for the principality of approximately 32,000 inhabitants, who pay no income tax and no capital gains tax. 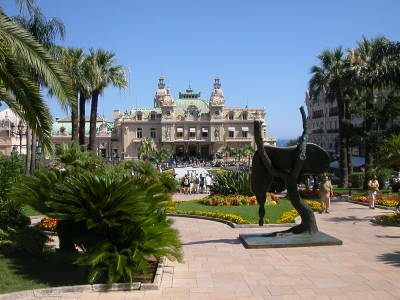 Surprisingly, the citizens of Monaco are not permitted to gamble in their own world-famous casino. Nice article! I think I'll be visiting this blog of yours more often.